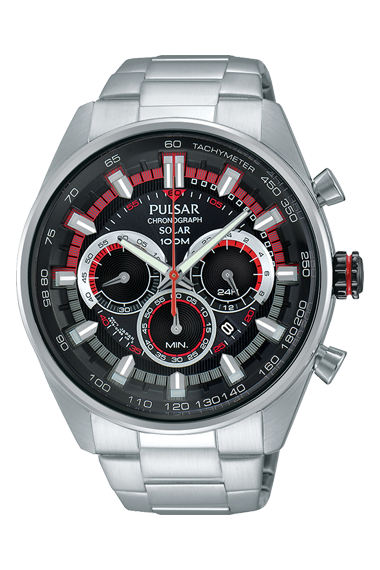 We are proud to be an independant retailer of Pulsar watches, made by Seiko. 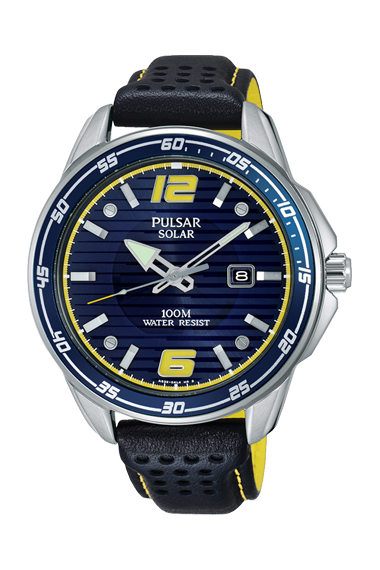 Pulsar burst onto the world watch market with the first ever LED watch in 1972 and since then the name has been synonymous with adventurous and leading edge design. 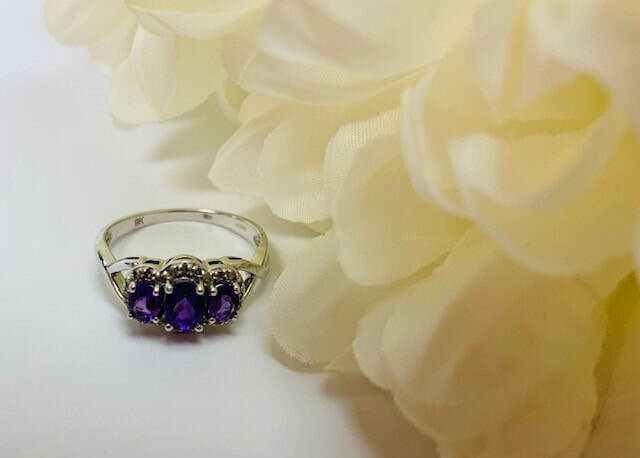 Today, Pulsar continues the tradition with new collections that are as individual, as distinctive and as desirable as any in the brands history. We stock a wide selection of sports models, dress watches and children's watches too. Browse the selection below and call for more information, or pop into store and try on today! 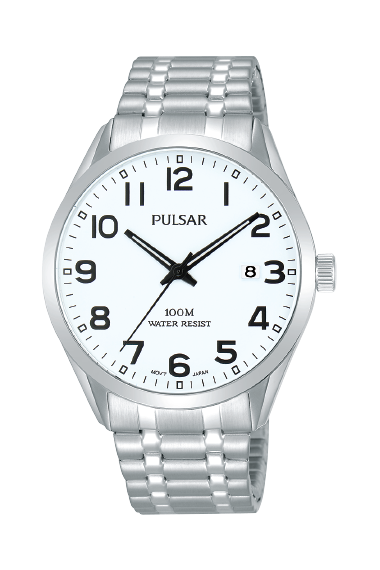 PS9539X1 Pulsar Gents white silver patterned dial, date, curved mineral glass, 50m W/R, s/steel bracelet. 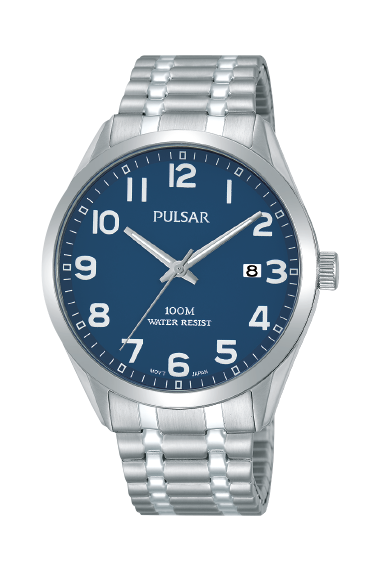 PT3897X1 Pulsar Gents white blue patterned dial, date, 12-24 hr indication, 60 min chrono, mineral glass, 100m W/R, s/steel bracelet. 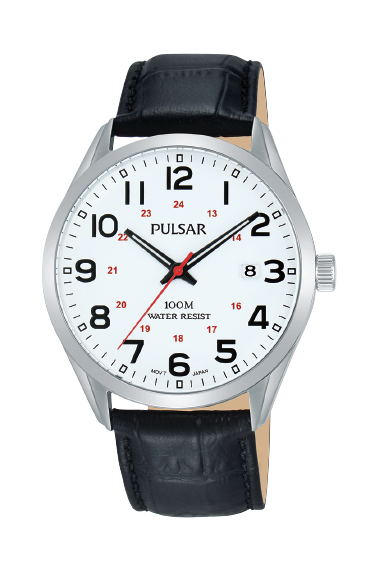 PT3901X1 Pulsar Gents white black patterned dial, date, 12-24 hr indication, 60 min chrono, mineral glass, 100m W/R, s/steel bracelet. 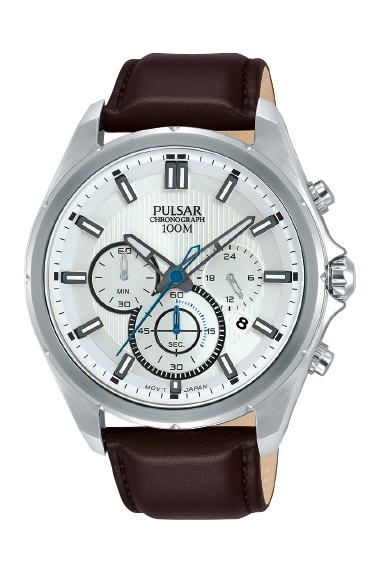 PT3903X1 Pulsar Gents white silver patterned dial, date, 12-24 hr indication, 60 min chrono, mineral glass, 100m W/R, brown leather strap. 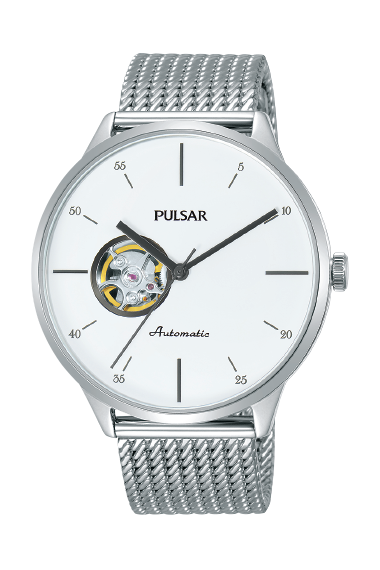 PU7019X1 Pulsar Gents automatic hand winding, white dial, date, curved mineral glass, 50m W/R, s/steel mesh bracelet. 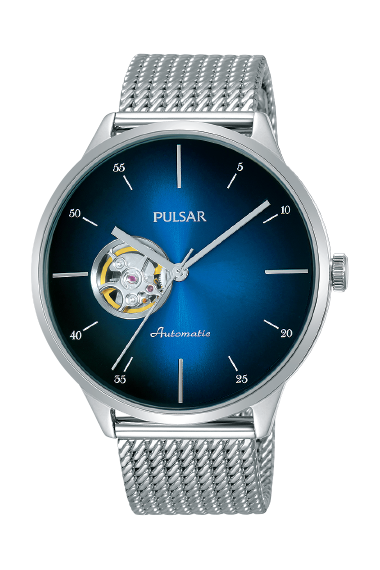 PU7021X1 Pulsar Gents automatic hand winding, blue graduation dial, date, curved mineral glass, 50m W/R, s/steel mesh bracelet. 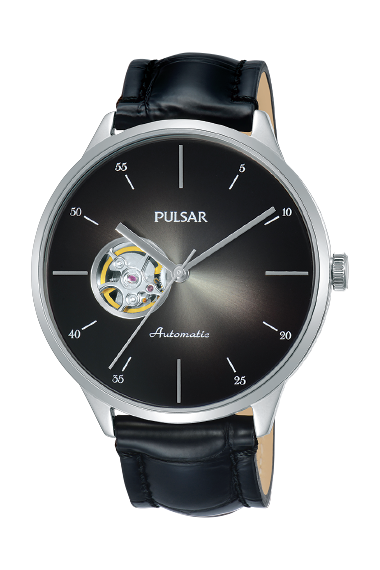 PU7023X1 Pulsar Gents automatic hand winding, black graduation dial, curved mineral glass, 50m W/R, black leather strap. 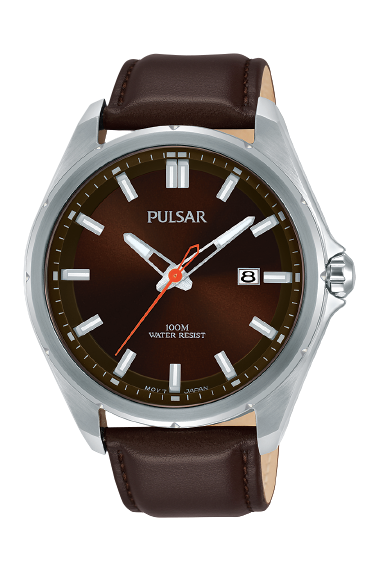 PS9555X1 Pulsar Gents quartz, brown dial, mineral glass, 100m W/R, brown leather strap. 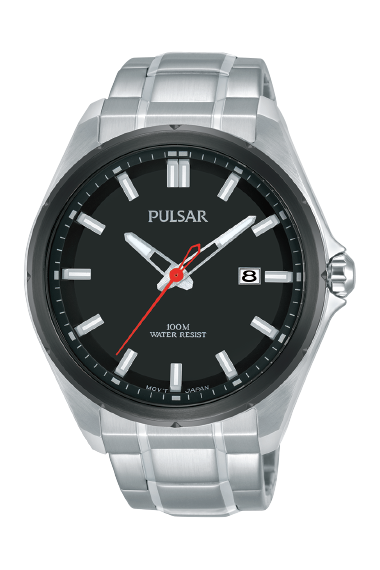 PS9551X1 Pulsar Gents, black dial, mineral glass, 100m W/R, s/steel bracelet. 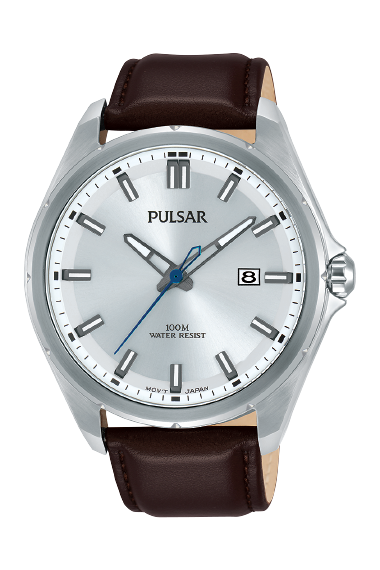 PS9553X1 Pulsar Gents quartz, silver dial, mineral glass, 100m W/R, brown leather strap. 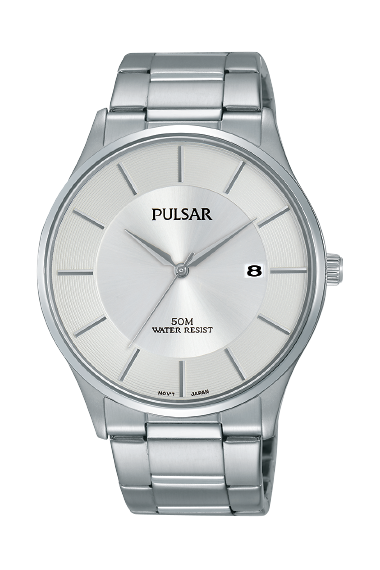 PS9565X1 Pulsar Gents two tone, white dial, mineral glass, 100m W/R, s/steel expansion bracelet. 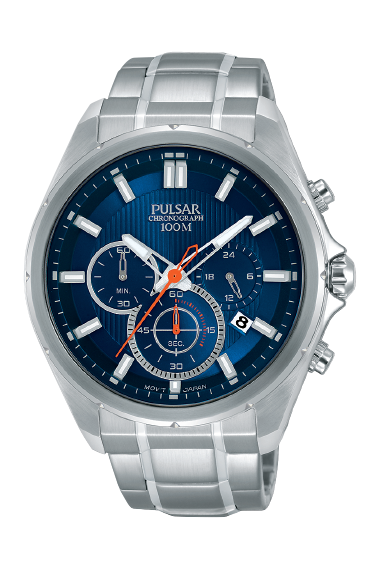 PS9561X1 Pulsar Gents, blue dial, mineral glass, 100m W/R, s/steel expansion bracelet. 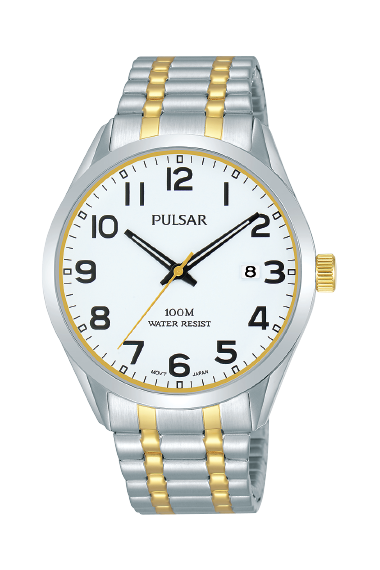 PS9559X1 Pulsar Gents, white dial, mineral glass, 100m W/R, s/steel expansion bracelet. 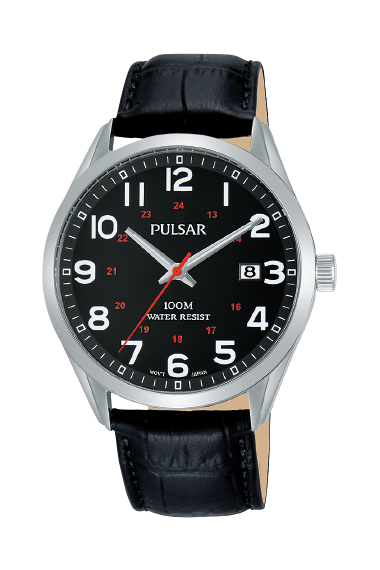 PS9567X1 Pulsar Gents, black dial, mineral glass, 100m W/R, black leather strap. 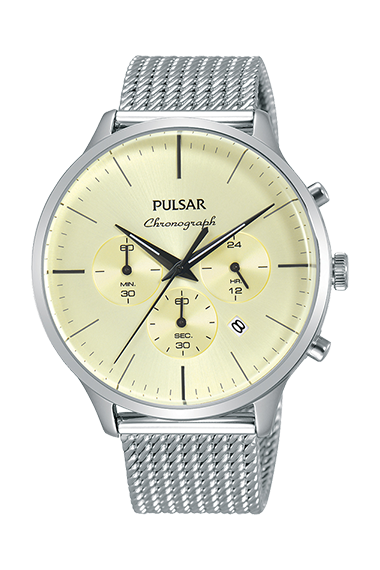 PT3859X1 Pulsar Gents, champagne dial, date, curved mineral glass, 100m W/R, 12-24 hour indication 60 minute chronograph accurate to 1 second, s/steel mesh bracelet. PT3863X1 Pulsar Gents, blue graduation dial, date, curved mineral glass, 100m W/R, 12-24 hour indication 60 minute chronograph accurate to 1 second, brown leather strap. 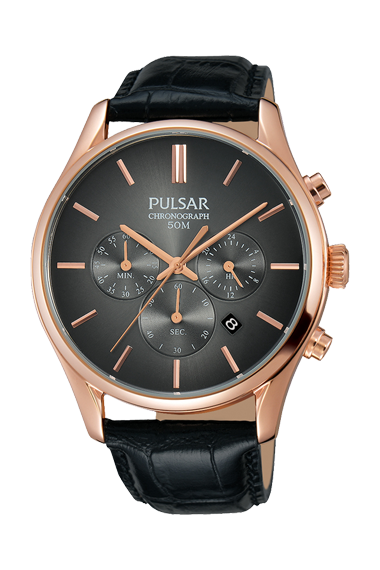 PT3782X1 Pulsar Rose Gold Plated Gents, black graduation dial, date, curved mineral glass, 50m W/R, 12-24 hour indication 60 minute chronograph accurate to 1 second, black leather strap. 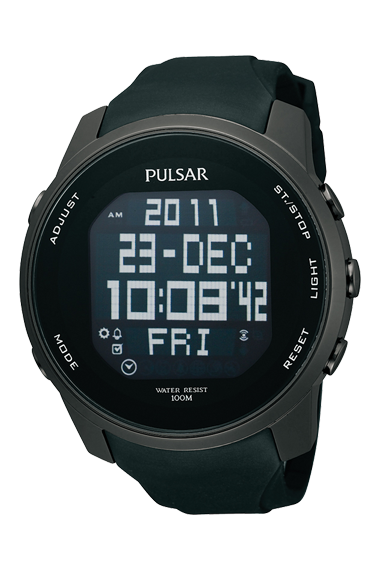 PQ2011X1 Pulsar Gents, black digital dial, mineral glass, 50m W/R, 5-channel regular alarm 99-hour chronograph accurate to 1/100 second, Split time / countdown timer / world time, Illuminating light (LED panel) / changeover between normal and enlarged display, black PU strap. 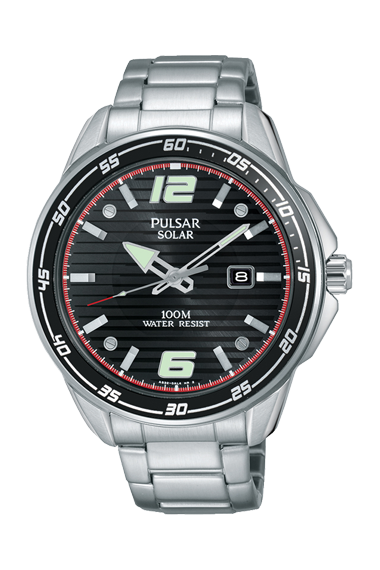 PX3089X1 Pulsar Gents Solar, black patterned dial, 100m W/R,mineral crystal, s/steel bracelet. 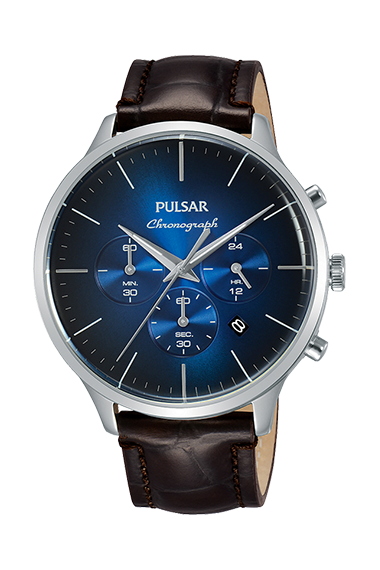 PX3091X1 Pulsar Gents Solar, blue patterned dial, 100m W/R,mineral crystal, black leather strap. 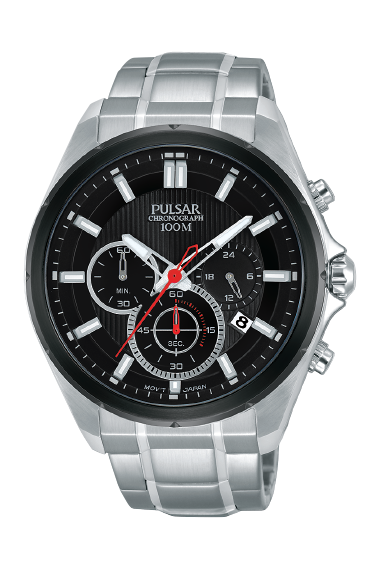 PX5017X1 Pulsar Gents Solar, black dial, 100m W/R, curved mineral crystal, 60 minute chronograph accurate to 1/5th second Split time, s/steel bracelet. 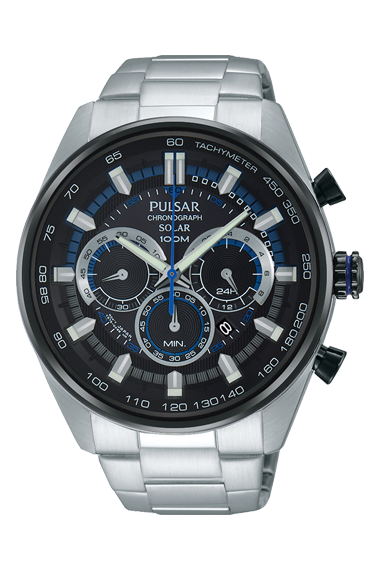 PX5019X1 Pulsar Gents Solar, black dial, 100m W/R, curved mineral crystal, 60 minute chronograph accurate to 1/5th second Split time, s/steel bracelet. 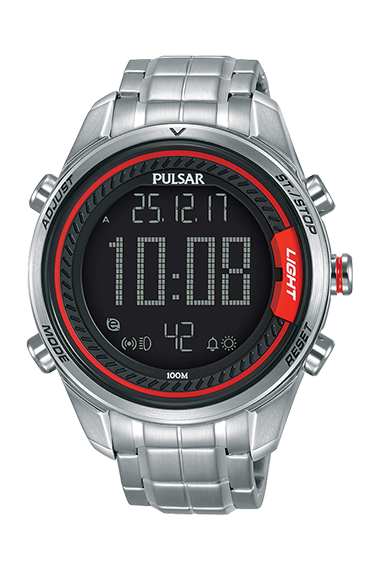 P5A001X1Pulsar Gents Solar, black dial digital, 100m W/R, mineral crystal, 3-channel regular alarm 9-hour chronograph accurate to 1/100 second, Split time, Countdown timer/World time/Illuminating light (LED panel)/Selectable display function options, s/steel bracelet.